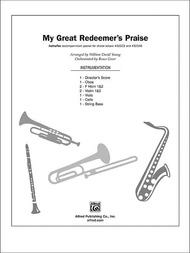 My Great Redeemer's Praise composed by Thomas Jarman, words by Charles Wesley. Edited by and arr. William David Young. Choir Sacred. For InstruPax. This edition: InstruPax. Choral (Sacred); Choral Octavo; Worship Resources. H.W. Gray. Sacred. Instrumental Accompaniment. 32 pages. Published by Alfred Music (AP.32345).This setting of O For A Thousand Tongues To Sing is infectious! The combination of Wesley's text and Jarman's brilliant fuging tune - LYNGHAM - is a masterful stroke. The Baroque feeling orchestration frames the anthem nicely without overpowering it.Inst. Parts Available (choral); Recorded Acc. Available. 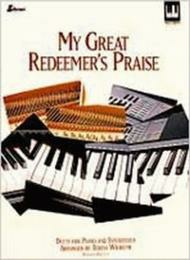 My Great Redeemer's Praise (Duets for Piano and Synthesizer). Composed by Teresa Wilhelmi. For piano and digital keyboard. Christmas, General. Moderately difficult. Published by Lillenas Publishing Company (LO.9780834190351).